The keyword focus of this web page is ‘green kitchen design’. Various iterations of the phrase appear throughout along with support keywords that are prominent in the website generally. The story draws a parallel between the art of baking and the art of building green. Quality ingredients (or raw materials) are transformed by the mastery of the baker or builder. Green kitchen design and remodeling is both science and art. You might say it’s a bit like the art and science of cooking. To prepare an exceptional meal a chef must begin with the very best ingredients. Naturally. But it is what the chef (or remodeler) does with those ingredients that make the meal (or remodeling project) remarkable. As a baker of bread, Alan Abrams knows this. His approach to green kitchen design is much like preparing bread. The ingredients (flour, water, yeast and a dash of salt) could not be more simple, could they? The transformation happens with expert handling of these ingredients and the sure knowledge of how they work together with time and temperature to produce the miracle of fresh baked bread. 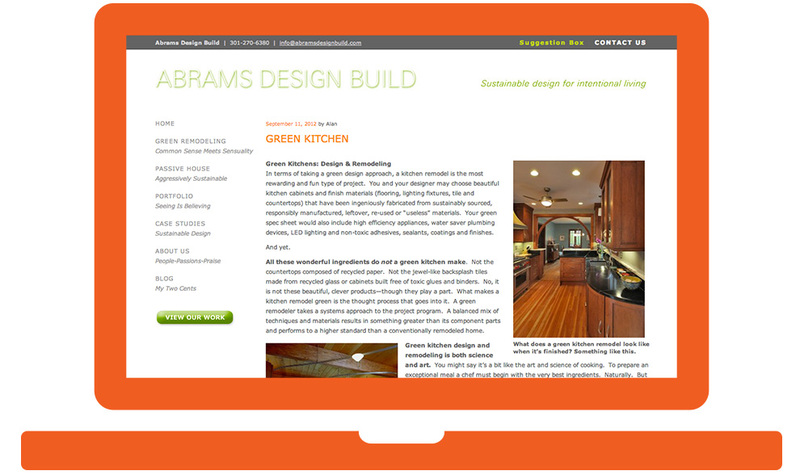 The Abrams green remodeling recipe includes generous helpings of intelligent building science and sustainable design transformed by artistry. And, if you are really nice, you might just receive the gift of fresh baked bread from Alan Abram’s own kitchen (which is, yes, a very green kitchen indeed).